April 2, 2019 Linn Nishikawa & Associates, Inc. The Maui Chamber of Commerce reported a new milestone for their annual Made in Maui County Festival with participating vendors generating nearly $2.5 million in product sales during the event in five years. A full report detailing the results and economic impact of the 5th Annual Made In Maui County Festival (MIMCF), which was held on Nov. 2-3, 2018 at the Maui Arts & Cultural Center in Kahului, Maui; is now available online https://issuu.com/mimcf/docs/2018_posteventreport. The festival is presented by the Maui Chamber of Commerce and supported by the County of Maui Office of Economic Development. Considered Maui County’s largest products show, last year’s event attracted over 140 vendors (including 15 companies from Molokai, 2 from Lanai, and 6 from Hana) offering hundreds of Made-in-Maui-County products. In addition, 16 food trucks also presented a diverse menu of island cuisine in the event’s Pasha Hawaii Food Court. Nearly $2.5 million on retail sales. Over 1,120 new wholesale accounts secured. Over 6,770 new leads established. March 11, 2019 Linn Nishikawa & Associates, Inc.
Today, the Maui Chamber of Commerce announced that sponsor opportunities are now available for their 6th Annual Made in Maui County Festival, This year’s event will be held on Nov. 1-2, 2019 at the Maui Arts & Cultural Center in Kahului. A variety of sponsor opportunities are available for companies and organizations interested in promoting their business to thousands of visitors and residents as well as publicizing their company’s brand, goods and services via the festival’s robust marketing efforts and on-site promotions. A special Festival Title Sponsorship is also available to put one’s company’s brand front and center of thousands of attendees and participants – people who buy and support local. Only one (1) Festival Title Sponsorship will be offered in 2019 available on a first-come, first-serve basis. Other exclusive opportunities include a Presentation Stage Sponsor, Opening Ceremony Sponsor, Best New Food Product Sponsor, and Entertainment Sponsor. February 22, 2019 Linn Nishikawa & Associates, Inc. The Maui Chamber of Commerce announced that Product Vendor and Food Truck applications are now available online for their 6th Annual Made in Maui County Festival. Considered Maui County’s largest products show, the festival will be held at the Maui Arts & Cultural Center in Kahului and will be open to the public on Friday, November 1, 1:30 pm to 6 pm; and Saturday, November 2, 2019, 8 am to 4:30 pm. Qualified wholesale buyers and distributors will also invited to a special “Buyers Preview” on November 1 to talk with vendors one-on-one about their products. As an added benefit, this year’s participating Product Vendors will also receive a membership in the Made in Maui (or their island) trade program, which includes use of the official trademark seal, along with other benefits. Additional information on the benefits will be provided to accepted vendors. Download a Product Vendor application or Food Truck application. Deadline for applications is May 31, 2019, by 4:30 pm (HST). Businesses will be notified of the Vendor Selection Committee’s decision on or before July 12. December 17, 2018 Linn Nishikawa & Associates, Inc. Drum roll, please! Hawaiian Airlines announced that Gayle Hart of Kula is the big winner of their random drawing held during the 5th Annual Made in Maui County Festival at the Maui Arts & Cultural Center on November 2 & 3. Gayle received 120,000 HawaiianMiles, which she’ll be using to take a fabulous vacation with her husband. 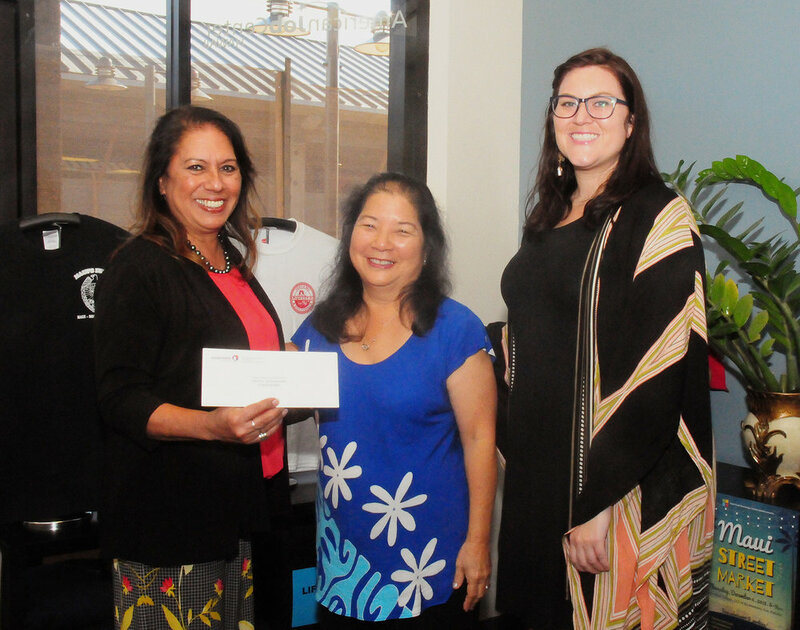 Hawaiian Airlines’ Leona Duarte (far left) and Maui Chamber of Commerce’s Amber Coutsos (far right) with Gayle Hart (middle).